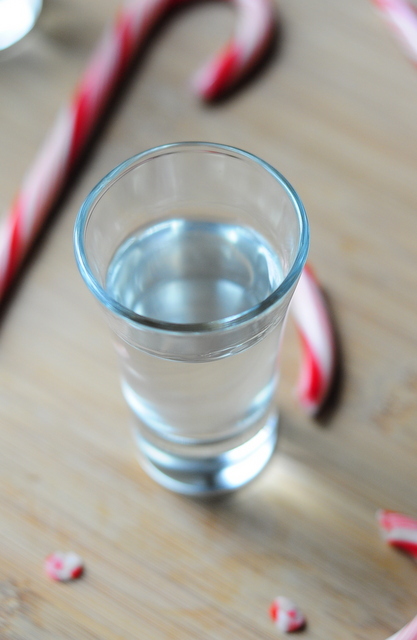 Peppermint schnapps is something that you probably only drink around the holidays, unless you’re German and happen to drink a lot of schnapps in general throughout the year. It’s a very strong mint-flavored alcohol that is slightly sweet and not unlike a candy cane in liquid form. 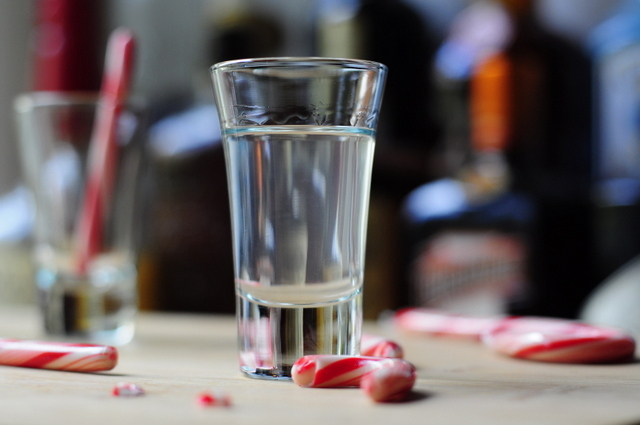 Peppermint schnapps is the perfect thing to have in your bar for holiday parties, but store bought peppermint schnapps tend to be pretty lousy. Their peppermint flavor can be overwhelming and even slightly medicinal, and some of them are simply too sweet and syrupy. I prefer to make my own Homemade Peppermint Schnapps this time of year. My recipe is easy to make and has a nice balance of sugar and peppermint in it, so it is minty and refreshing without being overwhelming. The perfect base for holiday dessert and after dinner drinks. Once you have schnapps, you’re ready to make peppermint martinis for your next Christmas party or spike a mug of hot chocolate with a little extra flavor as you’re sitting around the fire. You can also bottle this up and give your homemade schnapps away as a holiday gift to anyone on your gift list. Combine the water and sugar in a small sauce pan over medium heat. Stir occasionally until the sugar is completely dissolved. When the sugar is totally dissolved, remove from heat and let cool. Pour the simple syrup into a jar and add the vodka, and the peppermint extract. Seal the jar and shake well until the ingredients are combined. 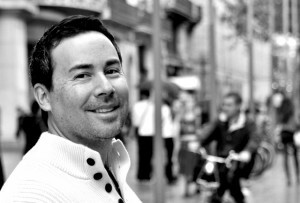 WOW – who knew it was so easy! What is your thought on Mint vs Peppermint Extracts? I’ll be checking out other tasty drinks as well, thanks! Rachel – Great question. Mint extracts usually contain both peppermint and spearmint oils. Peppermint typically has a more assertive flavor than spearmint, so a pure peppermint extract will usually have a stronger flavor than a mint extract. So, I stick with peppermint to make sure that I get the most flavor in a recipe like this one. Is this ready to be drunk immediately or does it get better over time? Can you use fresh mint instead of the extract? Well with my knowledge of making homemade extracts all you need is a jar or bottle, vodka and your mint leaves. Fill the bottle or jar with leaves (and I mean a lot) then cover them with vodka. Let sit. It will be minty almost immediately, but the longer it sits the stronger it gets! (With the max flavor being at probably a month) But yes it might be a little tinted in color but won’t hurt anything! Inge – Good question. You can, but your syrup might not be as clear as one made with extract. This might not matter if you’re planning to pour your schnapps into hot chocolate, but it will give other drinks a different look. You’ll also have to use quite a lot of mint, since you want the schnapps to be quite intense. Hello this sounds lovely, just wondering can you use the schnapps instantly or does it have to set for a while? I’ve seen some recipes stating two weeks in a dark place? I’m hoping for a ready to use recipe. Tanya – Yes, you can actually use this right away! Enjoy! I was wondering if you have made Lemon Liquor with essential oil and if the extract is the same ratio. Also, do you have to let it sit for any length of time before using, like a few weeks? Kyzmit – I haven’t made it using the essential oil, but I think it is worth a try! It should not have to sit for any particular length of time, as the steeping period is when the oils seep from the lemon peels. Try it with a small quantity and play around with the ratios until you find the right ratio. how long can I keep my homemade peppermint schnapps for if I store it in the fridge? Genna – You don’t need to store it in the fridge, however if you do it should keep for a very long time. I store mine in a cool, dark place at room temperature. It is fairly easy to go through a small batch like this one (especially if you like hot chocolate), but it keeps for weeks when stored properly. My mother in law made some a few years ago but used candy canes instead of extract. She has lost the recipe but wants to try it again. Do you have a recipe that uses candy? John – We don’t, but you can simply stuff a jar full of candy canes or peppermints and let them dissolve in vodka, releasing sugar and peppermint oil. You might find that you need to add more mint, as the candy canes won’t be as minty as the peppermint extract alone. Do you know how much percent this schnapps is roughly?